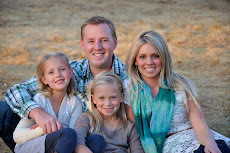 I'm jumping on here to say hello, and share a couple things I've been up to lately. 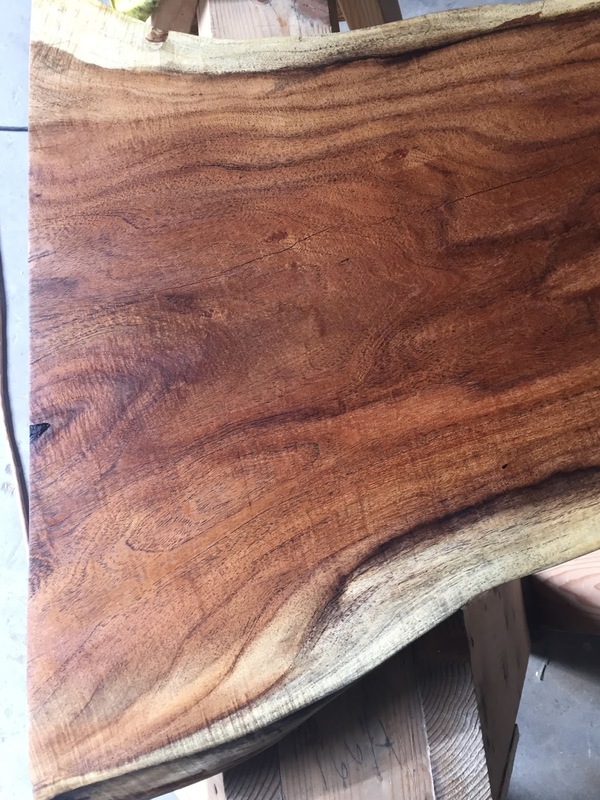 I recently purchased seven live edge slabs of wood. 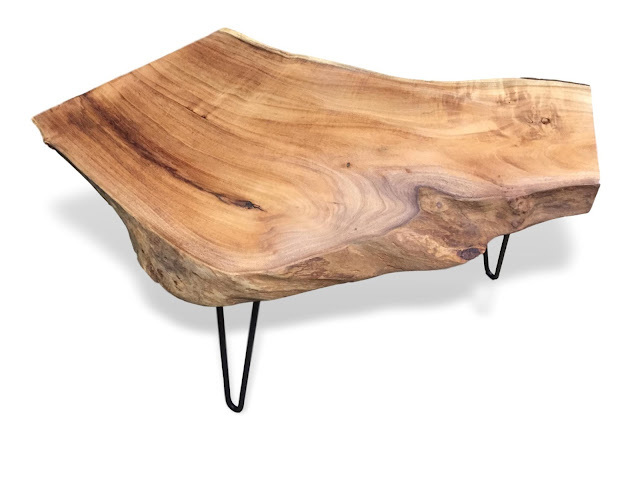 I don't know about you, but I'm totally on the live edge furniture lover train! So far, I've built a Console Table and a Coffee Table. Both of them have matt black steel hair pin legs. These legs give the tables a sleek modern look, and really allow the unique wood slab tops to shine. 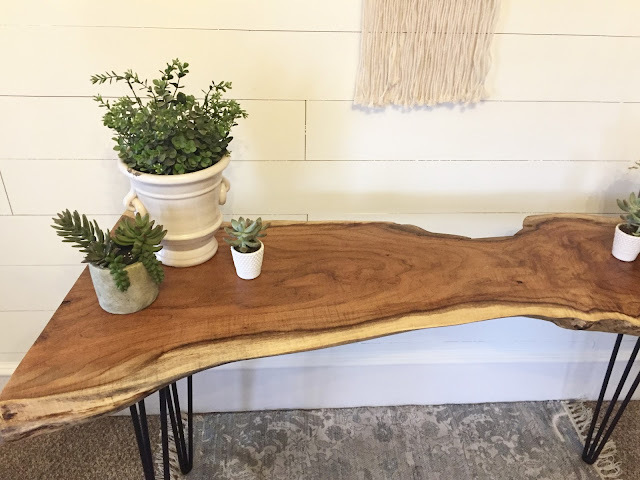 For the console table, I started by removing all of the lose bark with a chisel. 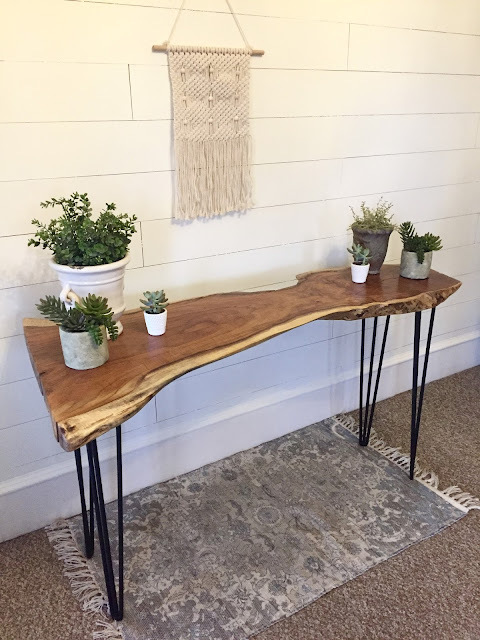 I do think that the live edge tables with bark are really cool, so I'm going to try and leave some on the table then next time I make one. The only problem is that there is a lot of dirt and lose material, so it can be more tedious to clean it, than to just remove it. Once the bark was off, I used a low grit sanding paper, and sanded down all of the rough wood with my belt sander. From there, I just started to increase my grits until I reached a 150 grit on my belt sander, and then I moved on with my palm sander. I started with 150 grit, and moved through to 180 and finished with a 220 grit. 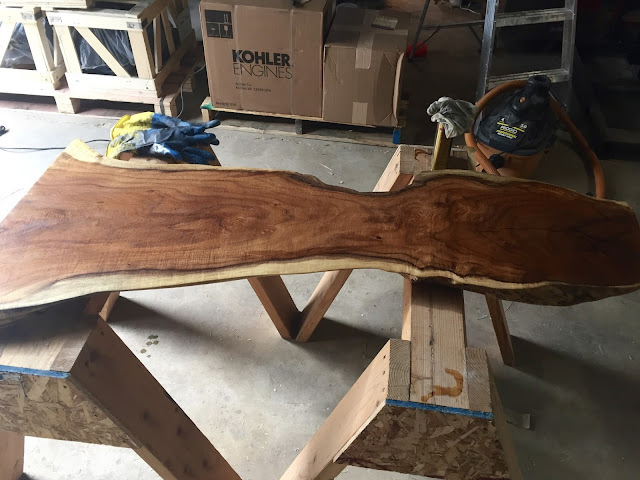 The walnut is already a nice hardwood, so 220 on this is just gorgeous! 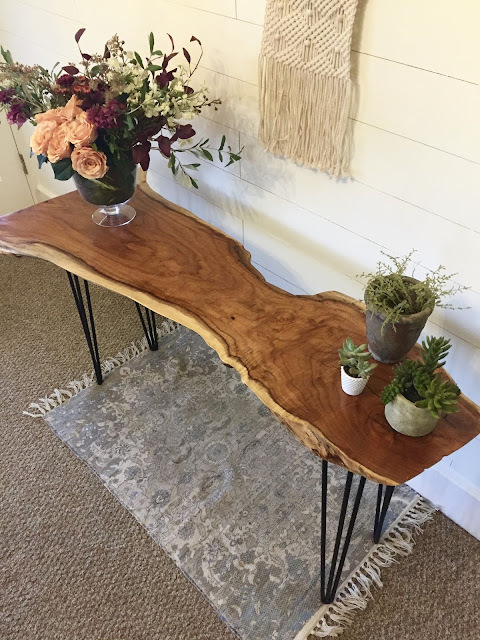 This is what the slab looked like with just one coat of satin Polyurethane! Already gorgeous! I wiped on a total of three coats. And I couldn't be happier with this beauty! 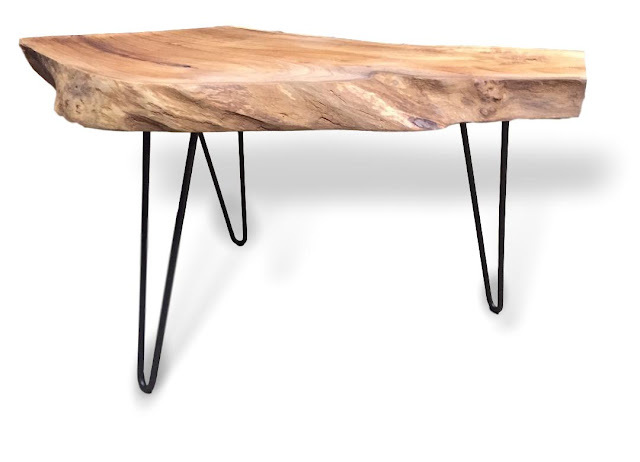 I purchased matte black hair pin legs to give the table that sleek midcentury modern look! 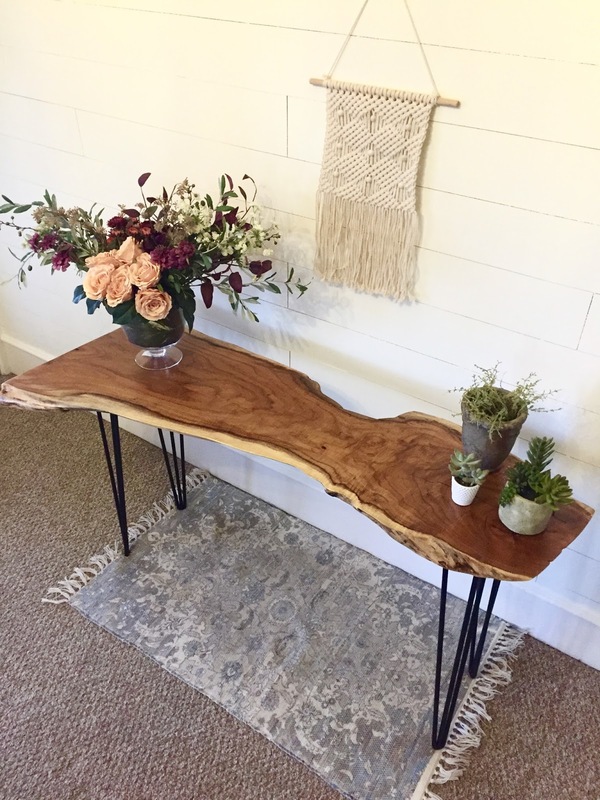 I did all of these same steps for the coffee table! I love them both and seriously cannot wait to make the rest of my slabs into gorgeous furniture! Thanks for visiting here today! I hope you enjoyed the photos and learning about the process! I love live edge furniture! Are you crazy about it as well? Have you ever made anything out of it, or want to try it? I would encourage you to! No one else out there will have the same piece as you! 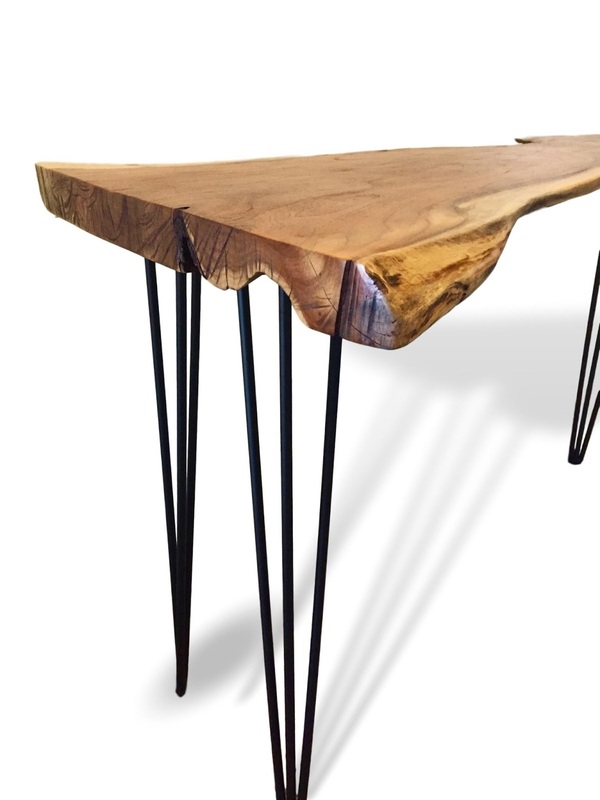 It will be a true one of a kind piece of furniture! 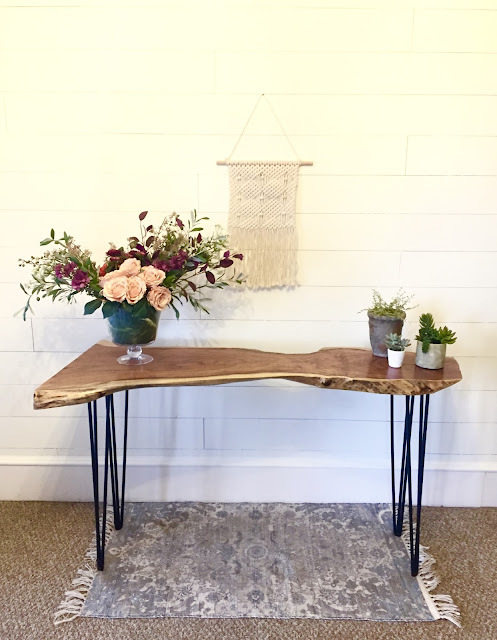 If you're not the woodworking type and would like to discuss having a custom built piece made, please email me at rustiquerestoration@gmail.com. I hope you have an awesome day! Thanks for stopping by!